Typing speed can be calculated in various ways. Every typing test examination has its own ways how it measures typing speed and accuracy. It completely depends on the recruiter board or commission which is organizing the typing test. In this post I am going to discuss how most typing tests calculate typing speed like typing tutor software including Soni Typing Tutor, online typing tests measure typing speed. These formulas are same equally applicable for both English typing and Hindi typing or any other language. There are two types of speed one is net speed and another is gross speed. Net speed is the speed in which only correctly typed words and characters are considered for speed calculation. Gross speed includes incorrectly typed words and characters also. Incorrect typed words are used to calculate typing accuracy. We at Soni Typing Tutor focus on accuracy so forget the gross speed because it is not your actual speed. Always focus on your net typing speed and accuracy. Number of characters typed in a minute. Characters, key strokes, key depressions, letters are the same thing. Blank space, backspace, enter or other non – character letters are not counted as characters. To understand it in simple words you can consider a character which prints on your screen would be considered a character. Enter, blank space, backspaces do not print anything on computer screen. For example the sentence “Soni typing tutor is trying it’s best to serve users” has 43 characters. Note : characters which were the part of a word typed incorrect will not be included in calculation. For example the sentence “Soni typing tutor is trying it’s best to serve users” has 43 characters. If a person typed “Soni typing tutor is trying it’s best to severe users”. He typed severe instead of serve. So characters of word severe will not be counted this time because this word is incorrectly typed. So character count in this case is 38 characters only. Number of correct Words typed in a minute is your speed in WPM. But the definition is not that simple at it appears. Real question is what a word is. Definition of word varies from examination to examination. There are two methods for words. Mostly words are counted by these two methods. Method 1: Number of characters (without spaces) divided by 5. So group of five characters is counted as a single word. For example the sentence “Soni typing tutor is trying it’s best to serve users” has 43 characters. Suppose all the words are typed correct. then the number words of would be 43/5=8.6 words. Incorrect words are not counted. Method 2: A word separated by space is counted as single word. 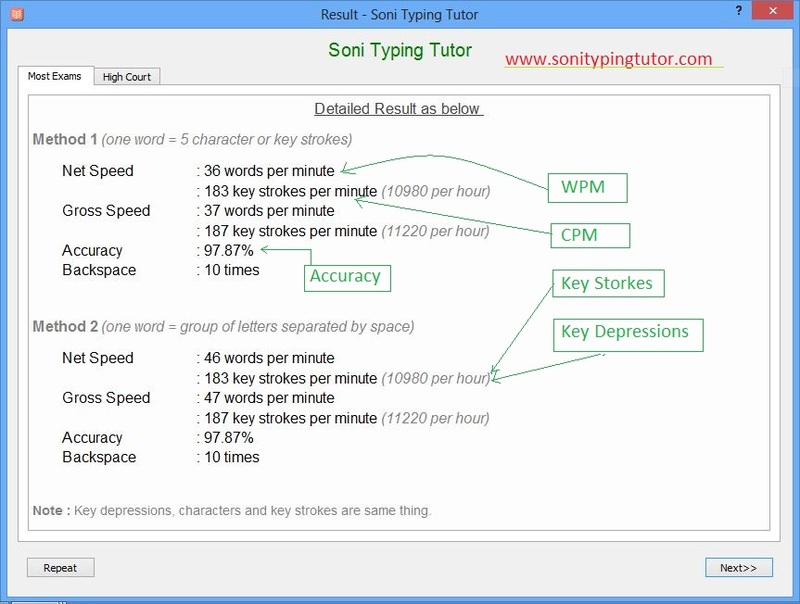 For example the sentence “Soni typing tutor is trying it’s best to serve users” has 10 words. Key strokes and key depressions are the same as characters per minute discussed above. Soni Typing tutor considers character, letter, key stroke and key depression same thing. The basic difference which should be noted is that the speed is measured for per hour not per minute. So your speed in this method is at per hour instead of per minute which was the case in the above two methods. Accuracy is the percentage of correct words out of total typed words. It is calculated in percentage. Suppose you typed total 100 words in a typing test. You have typed 85 words correct and 15 words incorrect. Then your typing accuracy is 85%. 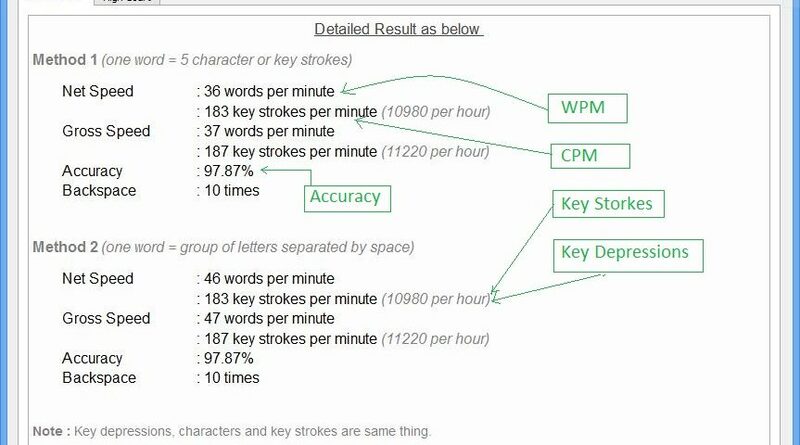 In a test in which typing speed is calculated in characters per minute, keystrokes/key depression per hour, that case accuracy include the characters part of correct words. Characters which are part of a incorrect typed word will not be considered in calculation of accuracy. Note: One must follow the instructions mentioned in the notification of his/her recruiting authority. Soni Typing Tutor shows detailed result using all the above methods in both English and Hindi Typing. English typing is absolutely free with Soni typing tutor. So just download Soni Hindi Typing Tutor and English Typing Tutor for free and go ahead towards your success.